The What: Spectrum Industries has introduced its newest active learning solution, the TechCenter—a technology driven product that can come in either a single (27.75-inch wide) or double (51-inch wide) unit. 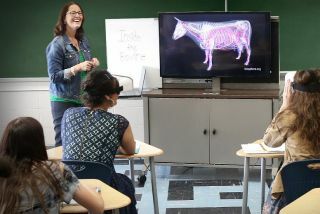 The What Else: There are a number of different display options available for the TechCenter including optional dry erase boards and the ability to hold up to two 70-inch monitors. This new product features a removable rear locking panel that provides full access to an optional 12 RU rack cube that can hold all AV or IT equipment. The TechCenter provides an optional power module featuring two power outlets and two USB ports to integrate power. Electrical options include the Power Switch, eLogix Timer, or the PowerProdigy to charge multiple devices. The TechCenter is ETL listed to the UL60950-1 standard. The Bottom Line: With optional casters, the TechCenter can help reconfigure classrooms due to its easy mobility and can stand the test of time due to its powder-coated, heavy-gauge steel frame, according to the company. From the recent expansion of Spectrum’s Expressions Line, new vibrant colors are available for the TechCenter providing thousands of laminate, edgeband, and metal combinations that can fit into any education, corporate, government or medical setting.